I’m not entirely sure why, but it took me over two years to get the cover illustrator Danny Hellman created for my 2016 book-type-thing 7 Days In Ohio: Trump, the Gathering of the Juggalos and the Summer Everything Went Insane framed and hung in my apartment. It might have something to do with me not wanting to have a giant image of a largely unclothed Donald Trump hanging in my living room, no matter how satirical and mocking the context. Not to put too fine a point on it, but I really do not care for that guy. 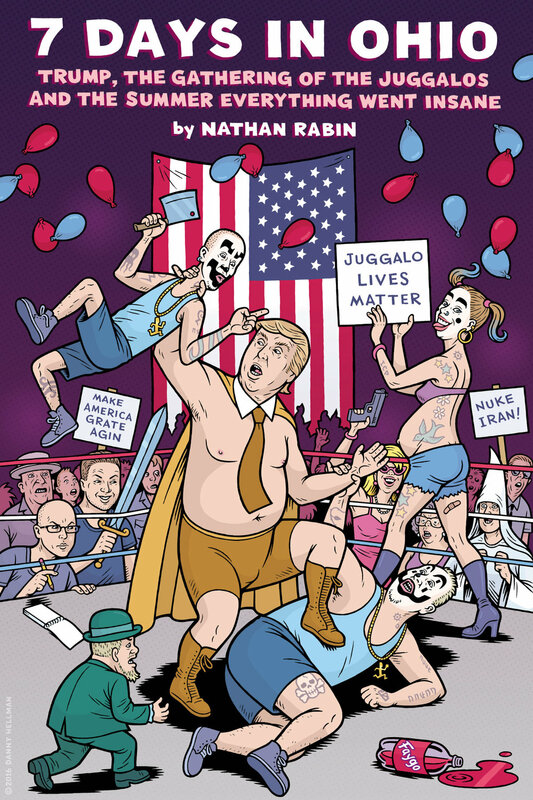 It also might have had had something to do with this cover being true to my experiences covering the 2016 Gathering of the Juggalos in Thornville, Ohio (where the wicked clowns will be triumphantly returning this year for Whoopstock, something I will sadly have to miss because of the imminent birth of my second child) and the Republican National Convention in Cleveland, Ohio in the same week and consequently just a little bit on the raunchy side. I realized just how raunchy when I brought it into my apartment and my three and a half year old son Declan really got a good look at it for the first time and began asking me questions. “Who’s that man with the sword?” he inquired eagerly. “Why does he have a sword?” my son followed up. “Well, he makes swords, and he made a sword for me that figures in the story in the book” I continued. “Oh, that would be President Trump” I quipped hilariously, and then chuckled to myself, for, when you really think about it, who are the real clowns? I’ll tell you who: politicians. But I did not have to point out Donald Trump to Declan because he already recognizes and dislikes Donald Trump. You might cynically say that’s because we tell him he’s a bad man but he came to his opinion on Trump all on his own. More questions from Declan followed. Who was that mostly naked pregnant clown-painted woman? I explained that it was a Juggalette ring girl. Why did that man have an axe? I explained that it was not an axe, but rather a hatchet, which is core iconography of Insane Clown Posse and the Dark Carnival. I similarly explained that this was no mere man: this was Shaggs the Clown, AKA Kangol Joe, AKA 2 Dope, AKA, Shaggy 2 Dope, AKA Southwest Strangla, AKA Bazooka Joey, AKA Stretch Nuts. It was around this time that my wife pointed out that this wasn’t the most appropriate image for a three year and a half year old with a vivid imagination to look at. It was Family friendly, in that I was repping the almighty Juggalo family hard with the cover of my second book about Insane Clown Posse and Juggalos (Whoop, Whoop!) but it wasn’t family-friendly in the conventional sense of being something it's okay for small children to look at. In the years ahead, Declan isn’t just going to wonder about the crazy covers of the three books I’ve written about myself and my life, in violent defiance of good taste and the market’s wishes: 2009’s The Big Rewind, 2013’s You Don’t Know Me But You Don’t Like Me and 2016’s 7 Days in Ohio. At a certain point, he's presumably going to be intrigued by their content as well. What will he think of me when he reads those books, if he reads those books? Will he be proud? Will he be ashamed? Will he empathize with my curious misadventures or recoil in horror at all of the mistakes I made? Will my literary legacy be a blessing or a burden? I have no idea. Then again, it’s also entirely possible that he’ll opt out of the whole shebang altogether, and while I think, on some level, that'd be a disappointment, it’d probably be a relief as well.